Early summer fishing patterns are emerging in the Indian River and Mosquito Lagoon here in East Central Florida with water temperatures in the mid to upper 70's, over the last few weeks of spring a migratory group of jumbo chopper Bluefish passed by our coast on their way north, with reports of them from area piers, beach, and inlets, we also had some find their way into the backwaters of New Smyrna Beach, long time regular client Gene from Ohio landed this one on a jig lure with trace of wire leader after we had several other lures bit right off the line by Blues heavy teeth, 13 lbs weighed on the boga grip scale����.. 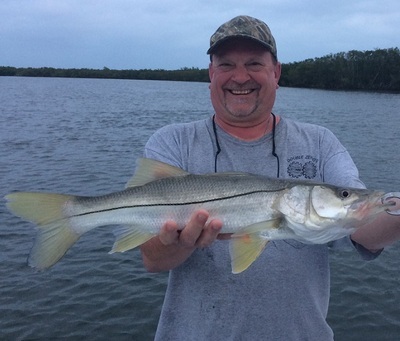 The annual multi day trip with Gene and friends had many highlights with great spring pattern catching on light tackle, Gene here with one of the several good Snook of the trips�����..
Ohio friend Scott caught plenty of good fish also including Trout, Snook, and Redfish������. Friend Adam from Daytona was also along on a couple of the trips, among all his catches were a couple good Black Drum and a 32" Redfish on a live shrimp and light tackle for a big battle�����. Gil from Mt. Dora came on a couple trips with visiting friends here for a spring break, Trout catching was good on these trips, Gil with a good one�����. 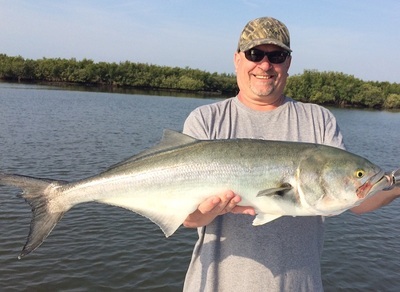 Very long time client Ed from Daytona came on his annual spring trip with a few friends, catching was quite good with all the usual back waters fish, Trout, Jacks, Ladyfish, and Ed was the star catching a great Redfish������..